☞ TICKETS: €10 full price; €8 for students and all other concessions. Tickets available ONLINE and at the door. Both cards and cash accepted at the cinema. ‘TO THE FOUR WINDS’ is entitled ‘LIBRE’ in French, meaning ‘free’. 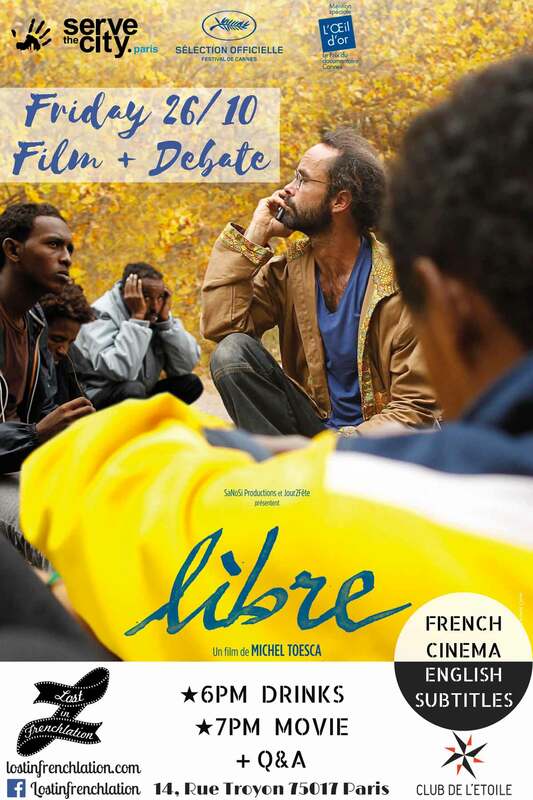 This remarkable documentary is unafraid to boldly declare its humanitarianism regarding the refugee crisis around France (which is why we at Lost in Frenchlation have presented it alongside Serve the City Paris, a local relief collective). TO THE FOUR WINDS is gripping, on both a political and a personal level. Cédric Herrou, the film’s subject, has been aiding refugees since 2015 and is now being accused of a ‘solidarity offense’…The film is necessary and relevant to understanding the legal complexities of the immigration crisis. The screening will take place at Club de l’Etoile cinema, located a short walk from the world-famous Arc de Triomphe. We will be offering a selection of Parisian drinks and snacks during our cocktail hour from 6pm. The screening is from 7pm, followed by a discussion with the film’s producer, a volunteer lawyer at CEDRE association, an asylum seeker under the Dublin, and active volunteer Danica Jurisic. Don’t miss this new film on Friday, October 26th at cinema Club de l’Etoile! Not only is it an opportunity in the cinema, but also a beautiful chance to engage as a citizen. Drinks begin at 6pm, screening at 7pm, and a fascinating discussion to follow!